FERGUSON, Mo. 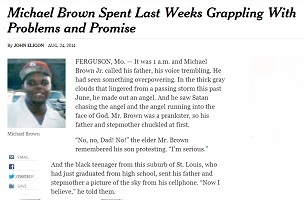 — It was 1 a.m. and Michael Brown Jr. called his father, his voice trembling. He had seen something overpowering. In the thick gray clouds that lingered from a passing storm this past June, he made out an angel. And he saw Satan chasing the angel and the angel running into the face of God. Washington Post media critic Erik Wemple wonders, though, if the NYT would have used the same description if Brown had been white. The paper’s national editor, Alison Mitchell, says yes; she also disagreed with Wemple’s suggestion that “no angel” is a loaded expression. Let’s get the obvious out of the way first: That choice of words was a regrettable mistake. In saying that the 18-year-old Michael Brown was “no angel” in the fifth paragraph of Monday’s front-page profile, The Times seems to suggest that this was, altogether, a bad kid.